"In affectionate remembrance of English cricket which died at The Oval, 29th August, 1882. Deeply lamented by a large circle of sorrowing friends and acquaintances, RIP. NB The body will be cremated and the Ashes taken to Australia." Australia's first victory on English soil over the full strength of England, on August 29, 1882, inspired a young London journalist, Reginald Shirley Brooks, to write this mock "obituary''. It appeared in the Sporting Times. Before England's defeat at The Oval, by seven runs, arrangements had already been made for the Hon. Ivo Bligh, afterwards Lord Darnley, to lead a team to Australia. Three weeks later they set out, now with the popular objective of recovering the Ashes. 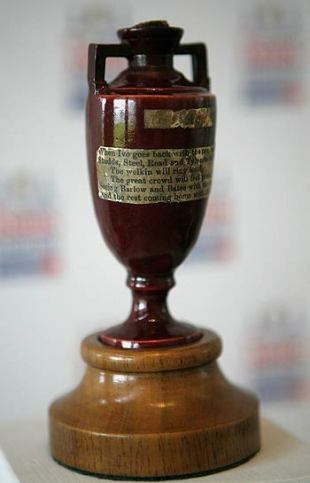 In the event, Australia won the first Test by nine wickets, but with England winning the next two it became generally accepted that they brought back the Ashes. It was long believed that the real Ashes - a small urn thought to contain the ashes of a bail used in the third match - were presented to Bligh by a group of Melbourne women. In 1998, Lord Darnley's 82-year-old daughter-in-law said they were the remains of her mother-in-law's veil, not a bail. Other evidence suggests a ball. The certain origin of the Ashes, therefore, is the subject of some dispute. After Lord Darnley's death in 1927, the urn was given to MCC by Lord Darnley's Australian-born widow, Florence. It can be seen in the cricket museum at Lord's, together with a red and gold velvet bag, made specially for it, and the scorecard of the 1882 match. And the rest coming home with the urn.